A tractor-trailer rolls along the highway in Miami last November. The trucking industry needs to hire almost 900,000 more drivers to meet rising demand, according to an industry analysis. America needs more truck drivers. The trucking industry is facing a growing shortage of drivers that is pushing some retailers to delay nonessential shipments or pay high prices to get their goods delivered on time. 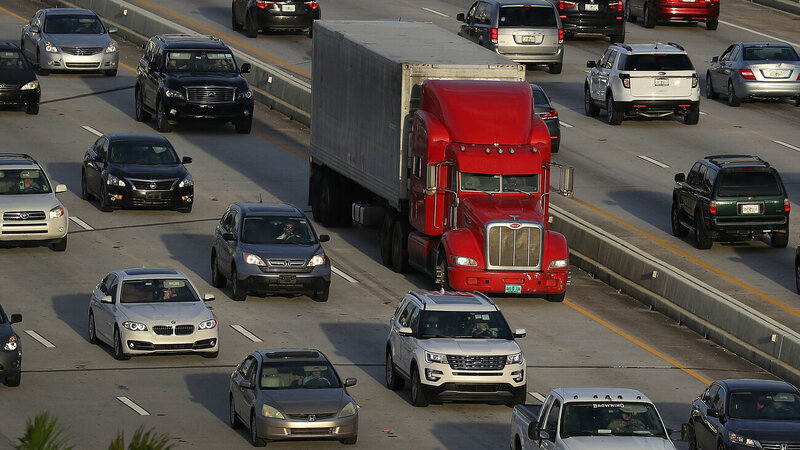 Derek Leathers, CEO of Omaha-based trucking company Werner Enterprises, tells Here & Now‘s Meghna Chakrabarti that truckers drive the American economy, but in recent years the industry has struggled to attract new drivers. The ATA report notes that the industry has struggled with a driver shortage for the past 15 years. During the Great Recession, freight volumes dropped, allowing the industry to meet demand with fewer drivers. But when volumes recovered in 2011, the driver shortage became a problem again. An aging fleet of drivers is one of the main reasons for the driver shortage. The Bureau of Labor Statistics estimates that the average age of a commercial truck driver in the U.S. is 55 years old. The industry also heavily relies on male drivers — only 6 percent of commercial truck drivers are women, according to the ATA. The industry has struggled to attract new drivers because the lifestyle of a trucker is less than ideal. Drivers are often forced to be on the road for extended periods of time, causing fatigue, and many suffer from undiagnosed sleep apnea. The Trump administration implemented new safety regulations in December that require commercial truck drivers to use electronic logging devices to record their hours. But many truckers say the federal mandate does not provide the flexibility they need. Leathers says his company has increased wages, so drivers can make up for lost time on the road. The median annual wage for heavy and tractor-trailer drivers was $41,340 in May 2016, according to the BLS. The electronic logging device (ELD) mandate is here, and there are still a lot of unknowns that go along with it. The industry is still waiting to see how the mandate will really impact capacity, rates, productivity, and, of course, the growing truck driver shortage. However, since the mandate went into effect on Dec. 18, one of the larger known issues associated with it is enforcement officer training. Though enforcement officers are not putting truckers out of service for not having an ELD until April 1, they are still looking to see if drivers are indeed complying with the mandate. FMCSA has maintained that CSA points won’t go against the carrier right away, but officers are still making notes in their inspection reports. According to Fakkema, who is a former 25-year veteran with the Washington State Patrol, the problem is that officers still don’t understand that grandfathered-in AOBRD truckers do not need to have an ELD – at least not until 2019. “The driver needs to indicate to enforcement, ‘No, I’m not [using] an ELD; I’m [using] an AOBRD and I’m grandfathered in,’” he explained. Through the month of December, Zonar saw a surge in ELD adoption rates, particularly among the smaller carriers trying to catch up with the mandate. Though adoption rates were on the rise nearing the Dec. 18 deadline, many smaller carriers and owner-operators are still deciding to hold out until “hard enforcement” begins in April, according to Fakkema. It’s a trend others within the industry are seeing as well. Kevin Hill, president and founder of CarrierLists, said that even a month before the mandate became law, two out of three smaller fleets had yet to install electronic devices. Among the smaller carriers he surveyed in the last two months, ELD adoption rates jumped to around 75%. However, adoption since has been flat, he noted. Hill pointed out that he believes many of those small fleets and owner-operators will indeed wait until April 1. “Say 5% or 10% wait and still don’t have ELDs. If you take 5% of the trucks off the market, especially with capacity as it is right now, there will be exponential results on that,” he said. According to DAT Solutions’ data for the week ending Dec. 30, van load-to-truck ratio was up 22% to 12.3 from 10.1 the previous week, and reefer load-to-truck ratio was up 33% to 23.7 from 17.8 the previous week. DAT analyst Mark Montague said those load-to-truck ratios are at record highs. Because of the activity in the market and strong economic growth, Hill explained driver time is going to become much more valuable as we head further into 2018. That means the shippers who are inefficient loading or unloading and have chronic detention problems will see their costs rise more than their competitors in 2018, he said. Hill also projects inefficient shippers will have two choices going forward: Pay higher-than-market rates, or invest capital to become more efficient in their production and shipping departments. In addition, DAT’s Montague stressed that with load-to-truck ratios setting record highs, it is imperative shippers make their operations more driver friendly. For instance, Montague emphasized the need for solid communication between the receiving gate and the dock to minimize loading and unloading times. He also suggested shippers make their facilities more available to drivers taking their mandated breaks. For those who haven’t yet installed an ELD, Montague noted that he believes there will be a lot of pressure to comply with the mandate before April 1. Montague added that particularly knowledgeable shippers are pretty well-educated on the mandate at this point and that they have been requiring their carriers and brokers to hire drivers with ELDs. “If you find out your load was delayed because the driver didn’t have an ELD and was stopped, that’s definitely going to be a huge negative,” he said. As for training drivers and making them more comfortable with the idea of using an ELD, Fakkema suggests fleet managers leverage drivers who have already embraced the technology to help mentor more reluctant drivers. Fakkema further stressed that education is key for drivers when interacting with enforcement officers. Newly released data show that trucking and other safety-sensitive workforces have the highest drug-positive test rates in a decade. The positivity increases are driven primarily by cocaine, methamphetamine and marijuana. The data also show the four common opioids that the U.S. DOT added last year in urine testing — hydrocodone, hydromorphone, oxymorphone, and oxycodone — have a higher positivity rate than the two opioids that were previously being tested — codeine and morphine. The following data is a summary of a recent report compiled from 10 million U.S. drug tests conducted by Quest Diagnostics, a large medical lab. Many of Quest Diagnostics’ clients have safety-sensitive workforces that have federally required drug testing, including pilots, bus and truck drivers. In the federally-mandated, safety-sensitive workforce, for which only urine testing is permitted, cocaine positivity increased by eleven percent (0.28 percent in 2016 versus 0.31 percent in 2017). This is the third consecutive year of increases in this workforce segment. A new pattern emerged in this year’s analysis, with cocaine positivity in urine testing increasing significantly in certain states among the general U.S. workforce. Double-digit year-over-year increases in at least four of the five past years were seen in the states of Nebraska (91 percent), Idaho (88 percent), Washington (31 percent), Nevada (25 percent), Maryland (22 percent), and Wisconsin (13 percent). In the general U.S. Workforce between 2013 and 2017, methamphetamine positivity rates increased 167 percent in the East North Central division of the Midwest; 160 percent in the East South Central division of the South; 150 percent in the Middle Atlantic division of the Northeast; and 140 percent in the South Atlantic division of the South. The percentage increase in these four U.S. Census divisions ranged between nine percent and 25 percent between 2016 and 2017. Quest Diagnostics has created this map that shows positivity by state and compared to the national average. Overall, marijuana positivity continued its five-year upward trajectory in urine testing for both the general U.S. workforce and the federally-mandated, safety-sensitive workforce. Marijuana positivity increased four percent in the general U.S. workforce (2.5 percent in 2016 versus 2.6 percent in 2017) and nearly eight percent in the safety-sensitive workforce (0.78 percent versus 0.84 percent). Increases in positivity rates for marijuana were most striking in states that have enacted recreational use statues since 2016. The increases in marijuana positivity for safety-sensitive workers increased by 39 percent in Nevada, 20 percent in California, and 11 percent in Massachusetts. “These increases are similar to the increases we observed after recreational marijuana use statues were passed in Washington and Colorado,” said Barry Sample, PhD, senior director, science and technology, Quest Diagnostics. Nationally, the prescription opiate positivity rate dropped by double digits on a national basis for the general U.S. workforce in urine drug testing. The rate declined 17 percent between 2016 and 2017 (0.47 percent versus 0.39 percent). The Trucking Alliance says hair sample tests will better screen for opioid use among truck driver applicants. 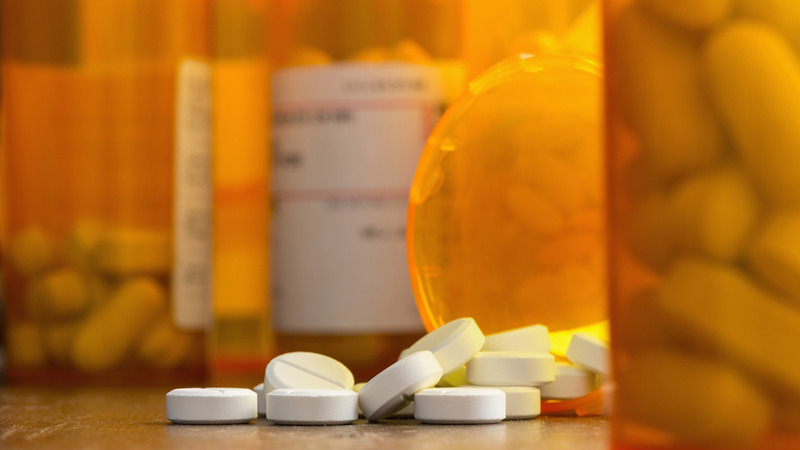 Prescription opiate testing for safety-sensitive transportation workers covered under U.S. Department of Transportation (DOT) rules went into effect in January 2018. Based on four months of data in 2018, Sample says the positivity rate for hydrocodone, hydromorphone, oxymorphone, and oxycodone are “certainly higher by large multiple” compared to the positivity rate for codeine and morphine. The additional four prescription opiates being tested are not more impairing nor more addicting than morphine, he says. Quest Diagnostics and other laboratories refer positive test results to a medical review officer (MRO). The MRO will then determine if the driver has a valid prescription for the drugs and has the ability to issue a safety concern letter to the employer. Many trucking companies are conducting hair follicle testing in addition to the DOT-mandated urine test. Based on Quest Diagnostics data, Sample says hair testing gives higher positivity rates. Hair tests detect patterns of repetitive drug use, he says. It is the most effective test for detecting cocaine use, says Sample, who has a Ph.D. in pharmacology and is a board-certified toxicologist. In other industries, oral fluid tests are also commonly used. Sample says the drug positivity rate for marijuana use is higher in oral fluid testing compared to hair or urine tests. “There is value in having more than one testing specimen at your disposal,” he says. The advantages of hair and oral fluid testing is they are observed collections. A sleep apnea rule would give clarity to medical examiners, carrier employers and drivers themselves about what conditions or combination of conditions would prompt a driver to be referred for an in-lab apnea test, as well as treatment protocol. Currently, medical examiners have the discretion to determine which drivers are referred for apnea testing. Absent a rule, such a system will remain in place. Industry-wide, the system has prompted questions and concerns, particularly since sleep apnea referrals can carry expensive out-of-pocket costs for fleets, drivers or both. The rule’s official withdrawal comes two weeks after the agency hinted in an annual regulatory update that the rule was on the chopping block. There was some confusion then, given that the report said the rule had been withdrawn on an unspecified date in June. However, no official notice had been published in the U.S. Federal Register, which is required to formally rescind a rule. Friday’s notice, however, validates the U.S. DOT’s July update to its regulatory calendar. The agency worked on the sleep apnea rule persistently in 2016, including the publication of a so-called pre-rule, listening sessions held around the country and apnea-focused meetings by two of its prominent advisory committees. However, the agency did not gather enough data to warrant a rulemaking, it said in the July regulatory update. FMCSA’s published pre-rule, known as an advanced notice of proposed rulemaking, last March sought industry input for guidance on developing a rule. The agency also sought input from its advisory committees last year, including the MRB and the Motor Carrier Safety Advisory Committee, whose members include trucking industry stakeholders. The groups recommended that FMCSA in its sleep apnea rule require drivers who have a Body Mass Index of 40 or higher be automatically referred for apnea testing. The groups also recommended that truckers with a BMI of 33 or higher, and who meet other qualifiers (like being male and older than 42), be referred for apnea testing, too. See the full list of apnea screening criteria recommended by the FMCSA committees at this link. Truckers referred for apnea testing, under the MCSAC/MRB recommendations, would receive a temporary certification pending their test results. FMCSA handed the trucking industry a significant victory this week when they announced a planned demonstration project to begin making preventability determinations on crashes meeting certain criteria and incorporating them into motor carriers’ CSA Safety Measurement System records. The announcement comes in response to comments by ATA on the Federal Motor Carrier Safety Administration’s 2015 Crash Weighting Study. Motor carriers will be able to submit preventability challenges beginning August 1, 2017, for crashes the agency feels are more likely to have been unavoidable. That includes crashes in which the commercial motor vehicle was struck: in the rear; while parked; by a motorist driving under the influence; or by a motorist driving the wrong way. Motor carriers can also challenge the preventability of certain single-vehicle crashes including: animal strikes; suicide by truck; infrastructure failures; or trucks struck by falling objects. If, after reviewing the evidence provided by the motor carrier, FMCSA finds the crash to be not preventable, it will be appropriately labeled on a carrier’s CSA profile and their Crash Indicator Behavioral Analysis Safety Improvement Category (BASIC) score will be re-calculated with the crash omitted. FMCSA will display this new score to logged-in motor carriers and law enforcement alongside the traditional Crash Indicator score which includes all crashes. FMCSA will use the data from the demonstration project to determine whether removing non-preventable crashes improves the accuracy of the Crash Indicator BASIC. The program will last at least one year. If you’re in Colorado Springs, you might buy a can of beer that was shipped by a self-driving truck. Otto and Budweiser announced Tuesday that they have reached a major milestone on the road to autonomous trucking with the completion of the world’s first shipment using a self-driving truck. Otto, which is now owned by Uber, teamed up with Anheuser-Busch to haul 51,744 cans of Budweiser from Fort Collins, through downtown Denver, to Colorado Springs. By using cameras, radar, and lidar sensors mounted on the vehicle to “see” the road, Otto’s system controlled the acceleration, braking, and steering of the truck to carry the beer exit-to-exit without any human intervention. Walter Martin, a professional truck driver since 2007, monitored the 120-mile journey down I-25 on October 20 from the sleeper berth in the back. Otto says the project had full support from the State of Colorado. The driver is still involved in picking up the load, making sure the freight is secured in the trailer. Once the truck is on the Interstate, he flips a switch and the truck drives itself down the road. As HDT’s Rolf Lockwood reported earlier this year, Otto hardware and software is tuned for the consistent patterns and easy-to-predict road conditions of highway driving. Sensors are installed high atop the truck, which offers an unobstructed view of the road ahead. With highways making up only 5% of U.S. roads, Otto says this allows a tight testing focus on a specific set of trucking routes critical for the American economy. Yesterday, the Federal Motor Carrier Safety Administration eliminated the regulation requiring commercial vehicle drivers to submit and retain Driver-Vehicle Inspection Reports when the driver has neither discovered nor been made aware of any vehicle defects. The FMCSA found that the time saved by eliminating the paperwork required by the DVIR rule will relieve the trucking industry of 46.7 million working hours and save $1.7 billion per year. In addition, the FMSCA stated that eliminating the DVIR rule would not have any negative safety impacts because other regulations still require drivers to conduct pre-trip inspections. The elimination of the DVIR requirement takes effect immediately, but is not eliminated for passenger-carrying commercial motor vehicles, such as busses. Late last night, President Barack Obama signed the $1.1 trillion spending bill passed by Congress that includes language to suspend the current 34-hour restart provision of the hours-of-service rule. Obama’s signature means—effective immediately—the industry will return to the restart provision in place prior to the July 2013 changes; allowing a driver to take as many restarts as he or she chooses during a work week and does not require that a restart include two consecutive 1 a.m. to 5 a.m. time periods. The Federal Motor Carrier Safety Administration (FMCSA) is expected to prepare a notice for the Federal Register that will explain ramifications of Obama’s action with respect to commercial vehicle enforcement. The Texas trucking industry and TXTA thank Congress, particularly Sen. Susan Collins (R-Maine), for the commonsense fix to these two unjustified provisions of the current hours-of-service restart rules in this year’s omnibus spending bill. Thank you, also, to TXTA members for your help notifying our Congressional delegation. Your involvement made a difference and our voice has been heard!